They call it the Spring Rendezvous at Fort — it’s a meeting of historical re-enactors showing 18-century Colonial American dress and life on the frontier. It’s very much a costume-con, but instead of science fiction/fantasy, anime & steampunk, we go into the Way-back Machine. This is my third Spring Rendezvous. I feel comfortable and know what I’m looking for in terms of photos. And this is one thing I will promise all of the Rendezvousers and Buckskinners — my photos of you and your event will be complimentary and respectful. I’ll leave the snapshots to others: I want event portraits that are worthy to hang on your wall. I wish there was a way to get the word out on that. By the way, a shout-out to the 42nd Royal Highlanders from Indiana for a great show and awesome uniforms. The 42nd is a fife/drum/bagpipe band that just sends shivers down your spine. They’re a tight band, precise, and good eye-candy too. Looking forward to the next Rendezvous, wherever it is…. I love this photo. I grew up in a town that revels in its colonial roots – the oldest inland city in South Carolina. 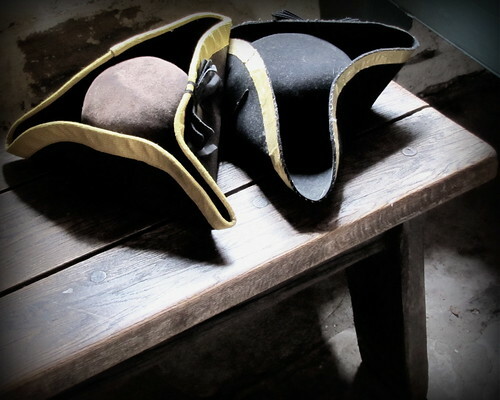 Tricorn hats and muskets. Redcoats and friendly natives. My dad helped found the historical society museum there.